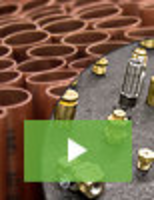 Tamper-Proof Socket Set suits automotive applications. 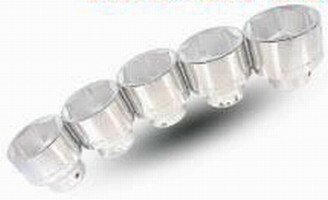 Socket Set targets professional mechanics. Made of heat-treated alloy steel, 10-piece external Torx Socket Set is designed to perform consistently and withstand heavy-duty applications. Sizes E5, E6, E7, and E8 are available in Ã‚-¼ in. 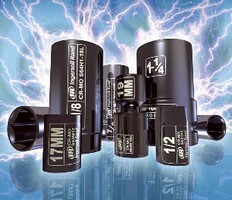 drive, while Sizes E10, E12, E14, E16, E18, and E20 are sold in 3/8 in. Each piece is laser engraved for quick identification, and complete set is stored in vinyl package. Accessory Set is rated for impact drivers. 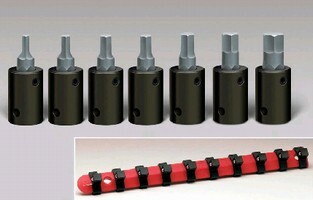 Impact Hex Bit Sockets resist wear and corrosion. Test Socket suits devices from 28 to 40 mmÂ². 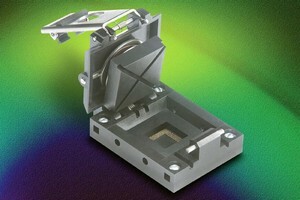 Impact Sockets withstand high-torque applications. Suited for industrial, automotive, and assembly professionals, SAE and metric Impact Sockets come in variety of drives sizes with deep, universal, and flip lengths. Units are made of chrome-molybdenum steel with electro-phosphate finish and laser-etched size labels for quick identification. Large-Drive Impact Sockets spread stress over large area. 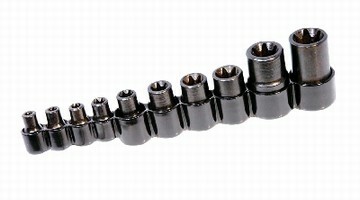 Impact Hex Bit Sockets come in inch and metric sizes.